A lot of people who are thinking about getting into vermicomposting wonder (understandably) what quantity of worms they should start with. There are plenty of recommendations out there but really, no one suggestion is necessarily better than the next. As such, I thought this might make for a good topic of discussion. In a nutshell (and in my humble opinion), the quantity of worms you start with entirely depends on what you are trying to do, and how quickly you are trying to do it. I’ll be honest – I used to wholeheartedly subscribe to the idea that worms should be allowed to “grow into their system”. In other words, you start a bin with relatively low densities of worms (less than the standard ‘1 lb per square foot’ recommendation), and simply allow the worm population to gradually increase over time, presumably reaching a ‘carrying capacity’ for the given system at some point. 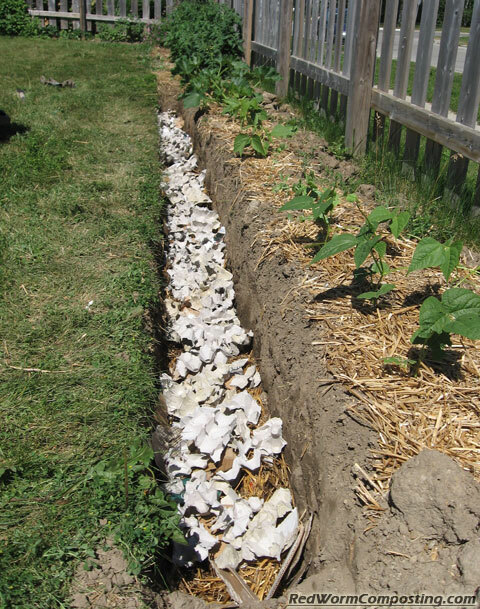 I definitely still see value in this approach, but now that I have my own worm business and have played around with dense concentrations of worms, I’ve come to recognize the composting power of putting a LOT of worms in a relatively small system! You may recall the post I wrote after putting 5 lbs of worms in a “holding bin” for a couple weeks while I was away this past Spring (see “5 lbs of Red Worms – WOW!”). When I arrived back home I couldn’t believe how thoroughly they had processed the upper levels of bedding and food waste. I also couldn’t get over the number of cocoons I found. For anyone interested in building a large population for their own use or to sell, this is definitely something to consider. I ended up harvesting a large proportion of the worms in the ‘holding system’, but it is now crawling with countless juvenile worms that hatched out from all those cocoons. I suspect that keeping worms so densely packed not only increases the opportunity for mating (they certainly don’t need to look far for a partner), but it also triggers the breeding urge to help protect against the possibility of a population crash (something that might occur in a ‘wild’ population). If you set up a series of identical bins and then simply moved most of your adult population from one bin to the next – leaving them to sit for a couple weeks in each – you could potentially end up with a serious worm nursery (good thing they don’t need diaper changes – haha), while still maitaining a large proportion of your original stock. Back to the topic of ‘more vs less’. Let’s look at a breakdown of the advantages/disadvantages of starting with more worms. As I’ve discovered many times myself, when you start small there is a much greater chance that other worm bin inhabitants will become ‘major players’ in the system, thus potentially limiting the upper size limit of the worm population. It can also be frustrating for a newcomer to sit and wait for their worms to get settled in and then grow in numbers before being able to REALLY witness the true power of vermicomposting. Don’t get me wrong – this approach may be perfect for some. If you are a person who really wants to test out vermicomposting, but you don’t mind (or you even prefer) doing so in a leisurely manner, then starting small is the best way to go. Just set up a bin add a small batch of worms or even cocoons for that matter, and then simply add food materials every once in awhile (or don’t add any more food at all – the worms will consume all the bedding if the ‘normal’ food supply gets cut off, and will likely be totally fine for months). If on the other hand you need (or at least want) results FAST, then starting with a larger population is definitely the way to go. In some ways, I suspect that many of the newcomer nightmares would be avoided if people simply set up their system well initially and added a decent quantity of worms. There would be less chance of overfeeding – which alone leads to many other issues – such as pest populations, anaerobic conditions, fungal spore production etc – and people would more quickly see how cool vermicomposting is. This approach does require more involvement though – so it’s a trade-off! Anyway – just my thoughts on the matter. I’d be interested in hearing what others think about all this. I realize the above photo is pretty poor quality, but I thought it would be fun to post it as yet another demonstration of the power of vermicompost! There is a tomato plant somewhere in there, and of course the Clematis up above, but most of the foliage you see belongs to what seems to have become a catnip bush! The plants in this bed are certainly getting plenty of nutrients from my big worm bin, but this is also one of the beds I’ve been adding food scraps to this year, so that likely helps as well. Our cats stay indoors full-time so they don’t get to romp in the catnip bed – what’s hilarious actually, is that when our cat Monty DOES manage to escape (seems to be his mission in life), he runs right past the catnip, straight to the lawn where he consumes as much grass as quickly as he can before his inevitable capture. Last year, the catnip plant (which was a decent size, but not the monster it is this year) was a regular stop for the outdoor cats in the neighbourhood. I remember one black cat in particular that made multiple visits – he/she even rolled around on the deck, as if to tease our cats (who were at the window intently watching). One of the known “disadvantages” of vermicomposting vs regular (hot) composting is that weed (and other) seeds are not killed during the process. Anyone who has left vermicompost, or even the inside of a worm bin, exposed to light is likely no stranger to the sight of various seedlings springing up. I generally pluck these seedlings out and turn them into compost themselves, but this year I decided see what would happen if I simply let them grow in one of my outdoor worm beds. As mentioned, I’ve been testing out different ways to process restaurant food wastes in a neighbour-friendly manner. 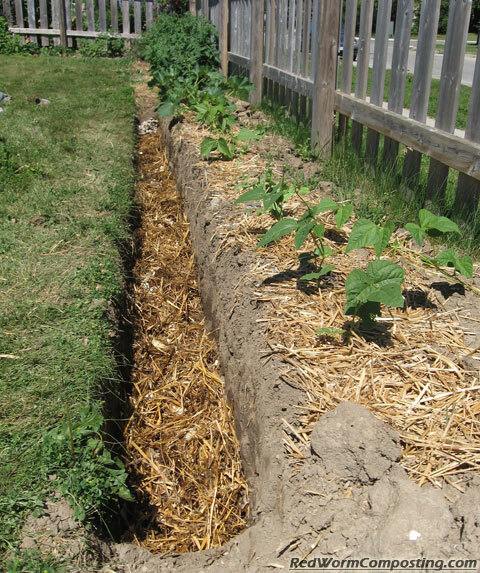 Aside from my trench vermicomposting method, I’ve been experimenting with the addition of waste materials directly on the surface of a garden bed (see ‘Garbage Gardening‘ over on the Compost Guy blog). I started up a worm bed in one of my small gardens in an effort to increase my composting area. It just so happened that the waste I added during the initial set-up had a lot of watermelon leftovers in it. Once I saw how quickly the seedlings popped up, I got to thinking that it might be fun to see what happened if I let a few of them continue growing. As is often the case with my yearly plantings, the melons got a late start – but hopefully I’ll still get the plants to bear some fruit before the end of the season. I have also been adding waste materials directly to other beds where plants were already established and have been pretty impressed with the results. Lots of composting worms seem to be more than happy to congregate in and underneath the decomposing waste materials, and again I am seeing plant roots spreading amongst the waste materials as well. One waste material that has worked surprisingly well is turnip. Given the fact that it is a pretty tough root vegetable, and has a waxed skin (to help it keep for months in storage), I thought for sure that it would very challenging to decompose. While it certainly does take longer than other materials, such as lettuce, for whatever reason the worms seem to love it. I’ve simply be piling it in underneath my straw mulch and leaving it alone. Whenever I check back I always find lots of worms crawling around on it. I will admit that dealing with all this food waste has involved a LOT of work this year, but as you can probably tell, I’ve been having a lot of fun with it! As I’ve written multiple times, composting worms don’t so much feed on the waste materials as they do one the microorganisms that have colonized (and are decomposing) the material. Based on this fact, I’ve thought of various ways to deliver microbes to the worms without necessarily feeding them rotting wastes. When I was young I remember learning that if you add grass or straw to a jar of water then let it sit in the sun for a few days you’ll end up with a soup of assorted aquatic microbes – various algae, paramecia, amoebae – some of them even visible to the naked eye when held up in the light. I’ve often thought about using this same idea to create a microbe soup for my composting worms. If a bedding material like corrugated cardboard was allowed to soak in this ‘soup’ and then fed to the worms, I suspect they would love it. As a fun little experiment I think I’m going to test out this idea by comparing the rate at which microbe-cardboard and plain-water-cardboard are colonized and consumed by the worms. Making microbe soup is extremely easy. All you need is a bucket, some water (preferably rain water or aged tap water), some organic matter (eg. grass clippings), and a cheap aquarium air pump (with tubing). In a sense, it is kinda like making compost tea. Simply fill your bucket with water, add your waste material, then gently aerate it while leaving it to sit in a sunny location for few days. As I suggested with the compost tea, you might even try adding a source of simple sugars, like molasses or honey, to help boost the microbe population even more. I have actually been playing around with this a little bit this year. I put some rotting spinach in a bucket of water and aerated the mix for a few days. This water was then used to hydrate coir bedding, which I was using for a new worm bin. It is hard to say for sure if the worms liked the ‘new and improved’ mix, but my hunch is that it was likely at least a little more inviting than plain ol’ coir soaked with water. I suspect that adding aeration isn’t nearly so important as it is when making vermicompost tea. In some ways I think a non-aerated bucket might be a little better since you won’t end up disrupting the colonies of organisms multiplying in the water column. The more vigorous the aeration, the more likely you just end up with slimy strings of biofilm stuck to the sides and bottom of the container – I’m sure this stuff would be like caviar for worms, but you won’t be able to soak your bedding with it the way you would with a uniform mix. Nevertheless, adding at least a little aeration is probably advisable so that you don’t end up with a stinky, anaerobic mess. I’ve been adding some food waste to a water-filled garbage can (I’ve been using to store rain water), and have been fascinated with the community of organisms that have developed. The water has become quite cloudy – very likely a good indication that the microbial population has grown considerably. I’ve also noticed the appearance of many Chironomid (midge) larvae (aka ‘Bloodworms’) – almost certainly there to take advantage of the rich microbial buffet available to them. It is times like this that I definitely wish I had my outdoor aquaponics system up and running (something I had planned for this summer), or at least an aquarium with fish. Bloodworms are outstanding as a fish food. Anyway, I’m going to start adding some of this water to my indoor worm tubs, and will start up a separate bucket to prepare for my little experiment. Since writing this post, I discovered firsthand why it is important to keep your microbe mix aerated! If the liquid stinks, DO NOT add in to your worm bin (or do so in a very small area to see what happens). I added some stinky water to a couple of my worm tubs and ended up with some dead and dying worms. I really didn’t think that the concentration of harmful compounds (that can be produced via anaerobic digestion) would be high enough to create issues, but clearly I was wrong. Luckily, I didn’t lose too many worms, but I’m still kicking myself for being so careless with it. So – once again – DO make your own microbe water, but make sure to add aeration from the start. Definitely DON’T add it to your worm bin if it smells really bad.